This contemporary Tuscan farmhouse extension dining table features hand-crafted Mahogany veneers and select hardwoods. Shown here in the Grigio finish with hand wire brushing. 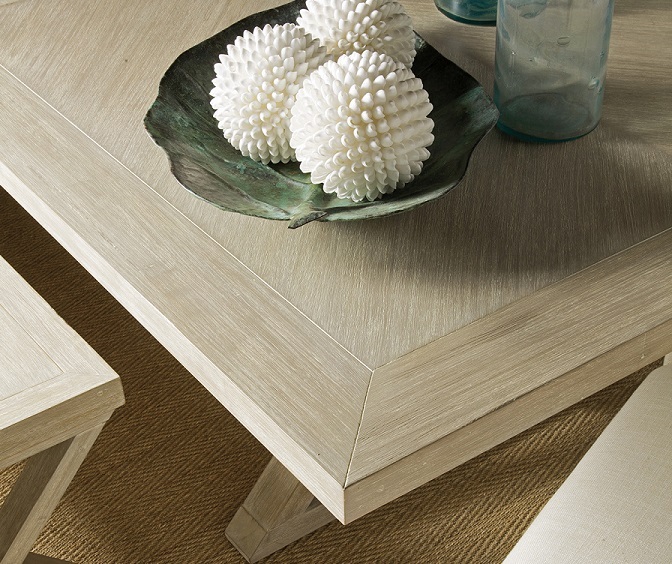 The top features mitered corners with a cathedral pattern veneer top, and a diamond match veneer leaf. Utilizing the 22-inch leaf extends the table to 110-inches and seats 10 - 12 comfortably.The iron stretcher is finished in a warm metallic with a hint of copper. Also available in Bianco and Marrone finishes. Dimensions: 88"W x 44"D x 30"H with one 22" center leaf. Click on Inset image to see detail of Bianco finish.